The Logic Pirate is an inexpensive yet capable open source logic analyzer. For just 30 bucks it can sample 8 channels, 256K samples per channel, at a blazing (overclocked!) 60 MILLION samples per second! It’s designed to support the SUMP logic analyzer protocol on Jawi’s open source software that works on most platforms. More than a year ago Ian joined the Amp Hour podcast and discussed his goal to make a highly useful, very accessible logic analyzer for around $30. A few weeks later forum regular m.gritsch contacted us about using his design as a successor to the Logic Shrimp v1. This type of logic analyzer is drastically different than a FPGA-based device like the Logic Sniffer we designed with the Gadget Factory so many years ago. The Logic Sniffer uses programmable logic to create memory, triggers, clocks, tons of fancy stuff all inside one chip. Data is acquired and stored directly inside the FPGA. The Logic Pirate (based on the Logic Shrimp, which was based on the closed-source Scanalogic) uses serial memory chips to store the samples. These chips have much more storage than a FPGA at a much lower cost, however they’re not as fast and lack the complex trigger logic found in a FPGA-based design. If you want max speed and complex triggers, an FPGA design like the Logic Sniffer is a MUCH better choice. A sneaky feature exploited by the Logic Pirate is overclocking. The SRAM chips used are rated for 20MHz (20MSPS) maximum. However that rating is at temperature and voltage extremes. In practice, we find that sampling up to 60MHz (60MSPS) is reliable in practice! If you’re willing to push the limits, this is a dirt-cheap, big-samplin’ smoking little logic analyzer. Continue below to read about the v1 initial design, or see the latest revisions on the documentation wiki. Analyzers for a large number of protocols: 1-Wire, I2C, JTAG, SPI, UART, etc. Available now at Seeed Studio for $30. The Logic Pirate uses serial SRAM chips to store the sample data. These chips are rated at 20 MHz. USB communication with the host computer and controlling of the SRAMs is done using a PIC32 microcontroller (MCU) which is rated at 40 MHz. Like CPUs on computer mainboards, the chips on the Logic Pirate can be overclocked. The manufacturer of the chips must be conservative on the specified ratings to ensure that the chips function correctly over the whole temperature range. We did some tests, and the SRAMs worked fine up to 80 MHz at room temperature. At even higher frequencies the chips were only loosing a clock cycle now and then, but were not harmed otherwise. Even having them running overclocked for several hours did not show any increase in the package temperature. Although it is very likely that the SRAM chips on your Logic Pirate have no problem being overclocked at 40 MHz, please understand that we cannot guarantee their functionality beyond the rated 20 MHz. Although we have not experienced any problems or even damage when using the overclocked firmware, please understand that overclocking is done at your own risk. To be able to switch between the regular and the overclocked firmware, or to update the firmware in case a new revision of it has been released, the Logic Pirate uses a bootloader. The bootloader is executed every time the Logic Pirate is connected to the host computer. If no enter-update-mode condition is detected, the bootloader exits and starts the firmware. Otherwise it enters the update mode and a new firmware can be uploaded. The bootloader always runs the PIC32 at safe 40 MHz, so changing back from the overclocked firmware to the regular one is always possible. The overclocked firmware dynamically switches the PIC32 to 60 MHz, but only after the bootloader has exited. To enter update mode please disconnect the Logic Pirate from the host computer. Then, place a jumper or jumper wire from the TEST pin to the 3.3V pin. When the Logic Pirate is reconnected to the host computer again, the LED will blink about two times per second to indicate that the bootloader is running. Start the bootloader application PIC32UBL.exe from the download below on your PC and check the Enable checkbox (1) in the USB group. Click the Connect button (2) and load the desired firmware (logic_pirate_40_MHz.hex or logic_pirate_60_MHz.hex) by pressing the Load Hex File button (3). Upload the firmware using the Erase-Program-Verify button (4), and you are done. Remove the jumper wire and disconnect and reconnect the Logic Pirate from the USB port. Don’t forget to select the corresponding Device type in the OLS Logic Analyzer Client: Logic Pirate (40 MHz) or Logic Pirate (60 MHz). The recommended host software is JaWi’s cross platform Logic Sniffer Java client. Support for the Logic Pirate is included since version 0.9.7. (Provided by the two config files ols.profile-logicpirate-40.cfg and ols.profile-logicpirate-60.cfg in the plugins directory.) Java must also be installed if it is not already present on the computer. The virtual serial port (CDC) is an open standard, it should work on any modern operating system. You don’t need a driver, but you will need a .inf file to tell Windows how to use the device. A suitable .inf file is included in the download below. Right-click on it and select Install from the context menu. If you are using Windows 8, read this note about how to install an .inf file. Select Capture -> Begin capture or the corresponding toolbar button (1) to open the OLS Capture settings dialog. Choose the correct Analyzer port (2) and the Device type Logic Pirate (40/60 MHz) (3) matching the firmware used. In the Acquisition tab the Sampling rate (4) and the Recording Size (5) can be changed. Finally, if desired, in the Trigger tab enable the Trigger checkbox (6), set the Before/After ratio (7), and further check the Mask 0-7 boxes (8) corresponding to the respective channels. The trigger is a very simple OR trigger. Any match on any configured pin will trigger the capture. The OLS Logic Analyzer Client is a very powerful piece of software, which gets continuously improved by its maintainer. Advanced features not discussed here are for example the analyzers for a large number of protocols: 1-Wire, I2C, JTAG, SPI, UART, etc. The TEST pin provides a 1 kHz square signal with a 75 % duty cycle by default. This signal can be used to test the Logic Pirate channels or to drive an external circuit. The frequency (2 Hz .. 10 MHz) and duty cycle (0 % .. 100 %) of the test signal can be changed by sending some custom commands to the Logic Pirate. An example Python script set_test_pin.py is provided in the download below. Examine the script for further details. The design of the Logic Pirate is based on the design of the Logic Shrimp. The principle of operation is quite similar, and you can read about it here in more detail. A faster PIC32 microcontroller allows shorter transfer times of the acquired data to the host application. Typically 0.5 seconds for 256 kSamples or less for smaller sample buffers can be achieved. Two serial SRAM chips are used in SQI (Serial Quad Interface) configuration to simultaneously capture 8 channels per sample. The serial SRAM chips are clocked by the REFCLKO output of the PIC32, which allows flexible clock rates from 2 kHz up to the internal core frequency of 40 MHz (60 MHz overclocked). 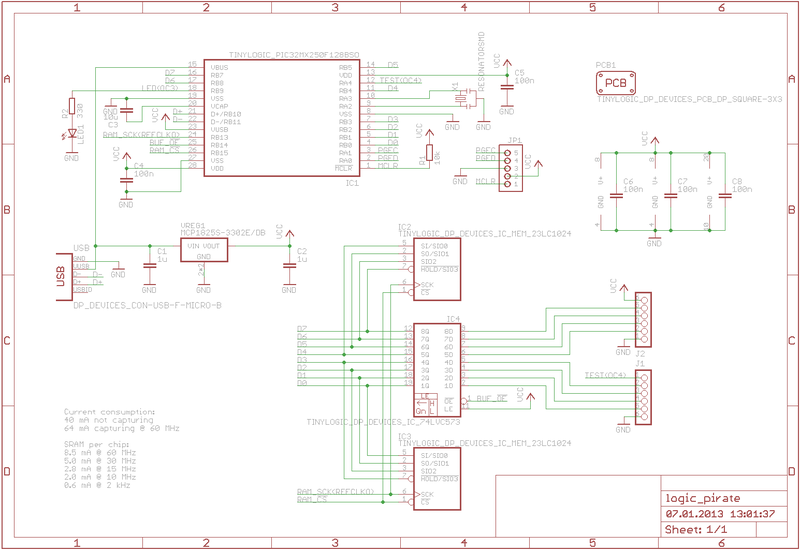 The schematic and PCB were designed with the free version of Cadsoft Eagle. Click here for full resolution‎. This entry was posted on Tuesday, April 15th, 2014 at 11:00 am	and is filed under Logic Pirate, Prototypes. You can follow any responses to this entry through the RSS 2.0 feed. You can skip to the end and leave a response. Pinging is currently not allowed. How does this compare to the 2 existing logic analysers you have made? Why 3? There’s lots of logic analyzer topologies, why not make an open source version of them all? They’re all unique and fascinating! 1. Logic Sniffer is more advanced (triggering, compression) more channels (32), fastest (200MSPS) equal samples depending on mode like RLE. It’s the best. 2. Logic Shrimp is cheap, fewer channels (8), more samples (256K), slower (20MSPS), simple triggers. You mean – beside the reasons given in the article? That it’s cheaper, smaller, easier to use, doesn’t require an FPGA – but is limited in speed and sample size? I see this as components on both sides, it looks like the first DP project with double sided soldering. Are they assembled by seeed? How much do they charge for double side assembly? It’s great to see you released a new prototype after a long period! Great product you have here. I’ll probably get one soon. – Is there a firmware that allows to use they board as a standalone data logger? – Why not also using it as a signal/pattern generator (like the USBee)? – When the PIC32MZ chips are available, they’ll give this project a huge boost. Looks nifty, and the price is right :) Will there be support for sigrok software too ( http://sigrok.org/wiki ) anytime soon ? How about galvanic isolation between each of the inputs ? Just got it in and it works great. This is great for those small projects I want to test out at home where I don’t have all the test equipment. But setting the trigger to 50% so I can see what happens before the trigger, that doesn’t work. Looks like it is alternating 101010101 filling the buffer before the trigger point. I was just looking at the test pin to channel 0. Firmware is listed in the meta data as June of 2014. This is all running on a macbook pro from 2012 and the latest software. I want to use this in one of my classes (I teach). The “nice” logic analyzers are complex enough that they tend to scare the students. Was the trigger tripped immediately? If it has no time to pre-fill before the trigger event the memory is 1010101 etc. Now if we can just get the Logic Sniffer to re-trigger after a specified hold off. That way we can get the display to update without clicking the recycle button. To bad one cannot vote on such requests.. Nothing in the forums about this?, or am I the only one who bought the Pirate? You are not the only one that picked up the pirate. I picked up one a couple of weeks ago and was so impressed, I just cleaned out the stock. I teach and want to use them in one of the labs, somehow it doesn’t look as intimidating as a full blown logic analyzer. Plus the students might actually use them when I require one to be in their electronic kits.